2018 is a wrap! Watch our recap video and stay in touch about summer efforts to bless our community. Every Christmas, you gather gifts, wrapping supplies, and funds. 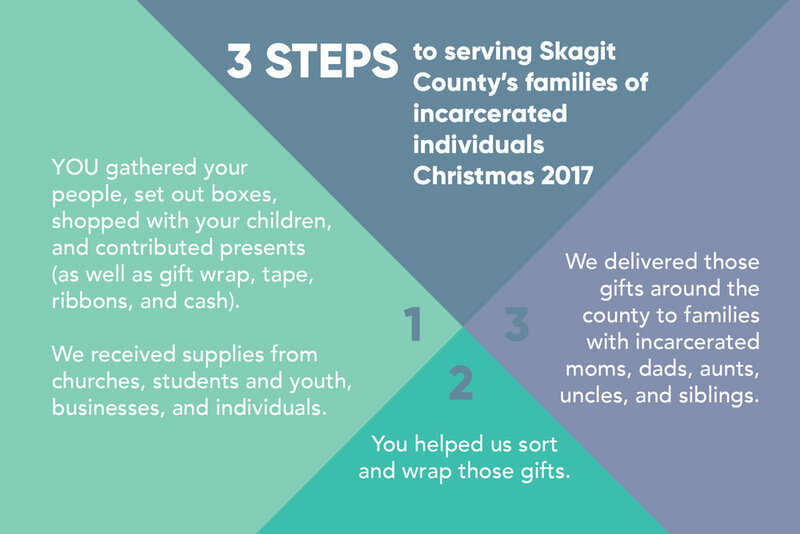 We deliver them to migrant families, our community in recovery from addiction, in housing/employment transition, and experiencing incarceration. This year, we’re beginning to gather our network of individuals, ministries, organizations, and businesses to provide some joy to local families. If you’re able to provide for kids of all ages, get in touch with us at admin@tierra-nueva.org. Some, but not all of the kinds of things we are looking for: board games, puzzles, Legos, fuzzy socks, coats, sports equipment, books, art supplies, stuffed animals! The kinds of things your kids would want! Thank you to our contributors and volunteers for 2017! We partnered with University Congregational United Church of Christ in Seattle, Christ the Servant Lutheran of Bellingham, Skagit Valley College, Pioneer Human Services, Billy's Cafe, and a bunch of generous individuals.